The Centroid is the average position of all the points of an object. When we cut a plane shape from a piece of card it balances perfectly on its centroid. The geographic center of the USA was found this way (near Lebanon, Kansas) in 1918. The Center of Gravity is the same as the centroid when the density is the same throughout. 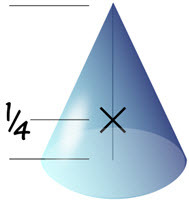 Center of gravity, center of mass and centroid are all the same for simple solids. The center of gravity of a car can be very hard to figure out, as there is lots of empty space and materials of different density (such as the engine vs the seats). When doing calculations we can often replace an object with its center of gravity. Example: You drop a hammer! It may spin a little, but its center of gravity will fall straight down. It also drops faster and faster due to gravity. A force that goes through the center of gravity won't cause any rotation. In fact you can balance an object by supporting it directly below its center of gravity. Where the medians intersect is the centroid. A median is a line segment from a corner to the midpoint of the opposite side.